Over the past several years, astronomers have discovered a number of planets within so-called circumbinary systems, including Kepler-34(AB)b — a planet reminiscent of Star Wars' Tatooine. Now, using computer models, scientists have finally figured out how these planets can form in such gravitationally hostile environments. 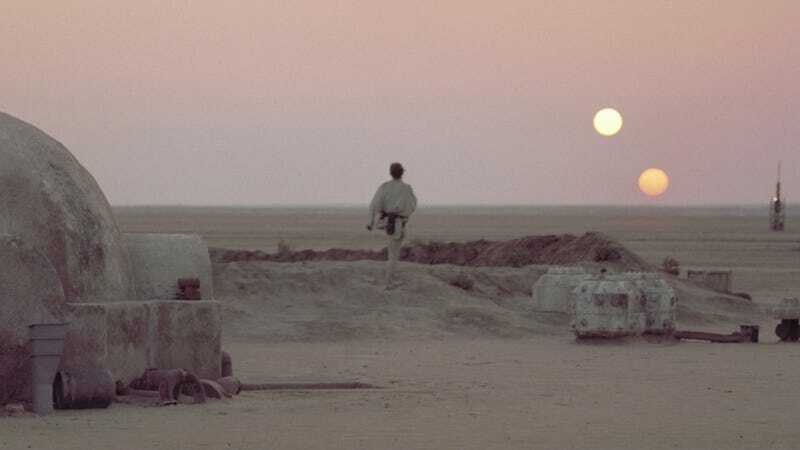 NASA: "We&apos;ve Discovered the First Tatooine-Like Planet"
Planetary formation in a single-star system is a relatively straight forward process. After a new sun flickers to life, its gravitationally bound debris forms into an accretion disc, which in turn coagulates into various celestial objects, like terrestrial planets and gas giants. But binary systems are much more complicated. When you've got two stars, powerful gravitational disturbances create destructive collisions that grind down the planetary building blocks. In this environment, impact velocities increase, as do orbital crossings, resulting in frequent high-energy collisions that thwart the growth of aspiring planets. Consequently, the standard accretion disc model fails to explain how planets form in binary star systems. But by using a computer model, and focusing solely on the Kepler-34 system, Zoe Leinhardt and colleagues were able to calculate the effect of gravity and physical conditions on and between about a million simulated planetary building blocks. The models showed that planetary formation in a circumbinary system is indeed possible — but the planets have to form far away from the central binary stars (about a distance of 1.5 AU) and then migrate inwards towards their current location. "Our simulations show that the circumbinary disk is a hostile environment even for large, gravitationally strong objects," noted Leinhardt in a statement. "Taking into account data on collisions as well as the physical growth rate of planets, we found that Kepler 34(AB)b would have struggled to grow where we find it now." Looking at Kepler-34 specifically, it seems likely that all currently known circumbinary planets also drifted significantly inwards from their formation locations (with the possible exception of Kepler-47 (AB)c which is further away from its two parent stars than any other examples). "Circumbinary planets have captured the imagination of many science-fiction writers and film-makers — our research shows just how remarkable such planets are," said lead researchers Stefan Lines. "Understanding more about where they form will assist future exoplanet discovery missions in the hunt for earth-like planets in binary star systems." Read the entire study at Astrophysical Letters: "Forming circumbinary planets: N-body simulations of Kepler-34." Image: David A. Aguilar, Harvard-Smithsonian Centre for Astrophysics.